Mean reversion strategy involves speculating that stock prices shall revert back to the average or its mean price. The market continuously moves in phases of in and out of the median price, allowing investors to formulate their investment strategies based upon mean reversion. An example of mean reversion strategy is buying a stock post its price has experienced an unusually large fall. When the price of a stock falls, there are good chances for the price of the stock to bounce back towards its normal levels. The method of utilizing this strategy while investing in stocks is to look out for extreme events and bet on things to reverting back to normal. Financial markets are not generally distributed and have extreme events and a long tail which can cluster together at once. Feedback loops can escalate this, creating momentum, which is terrible news for mean reversion. For instance, when the price of a stock declines by 10% on day 1, there is a possibility of the stock price to drop even further the next day. Nonetheless, the investors and traders rely on mean reversion strategy to build their trading systems. There is no surprise that the Relative Strength Indicator is useful to measure and detect mean reversion. RSI for short periods, under 5-day, works well for detecting mean reversion. A value of under 10 is an excellent indicator for a pullback after the bearish phase. The %B is the closing price of the stock relative to the lower and upper Bollinger Bands. The value of 0 is considered closer to the bottom band whereas a value of 1 is considered close to the top band. A trader looks for a closing price which is stretched under the moving average. For instance, the close is at 5% below the 10-day moving average price indicates a pullback. This computes how much an individual stock price has changed in the last ‘x’ number of days. ROC is calculated using close today’s price divided by x minus one day. Investors typically look up to 3 to 10 days back and the values between 5% to 15% to understand how much has been sold off. This is a simple technique which looks for stocks which have closed lower than its opening price for 3-6 days in a row. This is a good indication of a pullback. This technique compares the lowest closing price in the last ‘n’ number of days and seeks for the lowest closing price which can be a 5-10 day closing low. This technique uses the current closing price vs the lows and the highs of the last 5-30 days. Traders use the formula [current closing price – lowest price within the last ‘n’ number of days]/difference between the highest and the lower price within the last ‘n’ days. Different investors and traders set different values towards formulating their investment decisions. When the price of a stock drops 15 or 25%, these price falls are generally due to a reason, and it is vital to understand the cause of the price fall. If the price fall is due to a significant reason, like a game-changing news break, structural changes etc., the probability of the stock returning back to normal price in a short amount of time is low. These events lead to momentum which is not favorable for the mean reversion strategy. But at times, the stock prices can fall due to less than obvious reasons, such an imbalance caused in the market due to a big sell order or an over-reaction to an external event. Such events of price falls are a perfect opportunity for traders to employ their mean reversion strategy. Traders look for price falls due to over-reaction or market correction, and not fundamental changes while employing the mean reversion strategy. 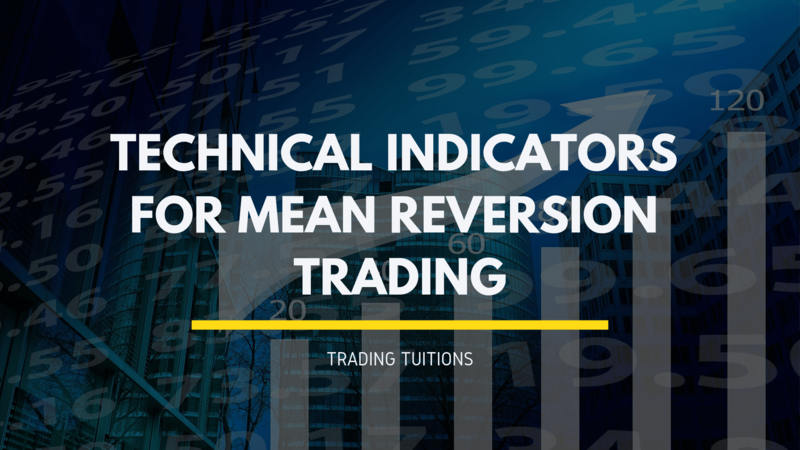 Technical indicators such as the relative strength indicator, %B, moving average stretch, the rate of change, days down, N-days low and closing range help traders and investors to identify opportunities to employ the mean reversion strategy. Why Professional Forex Traders Trade With Regulated Brokers?